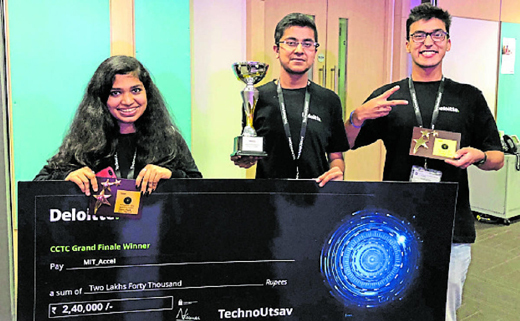 Mangaluru, Apr 20, 2018: The Team Accel from Manipal Institute of Technology, Manipal, emerged as the National Champions of Deloitte TechnoUtsav Collegiate Cyber Threat Competition (CCTC) to bag a prize money of Rs 2.4 lakh. The three-member team included Kushagra Sharma (team captain), Poorvi Hegde and Aakash Bahl, all third-year students. TechnoUtsav CCTC was conducted in about 60 campuses through a series of online rounds and challenges for over a month and the top 10 teams were invited for the Grand Finale at Deloitte, Hyderabad Campus where the main focus was to engage students in practical cyber challenges and at the same time they were exposed to some of the world-class processes and technologies that enable Deloitte to provide transparency, efficiency, and productivity on a daily basis. The grand finale comprised three elimination-based gamification rounds to test the skills of students as a cybersecurity specialist. They were exposed to real-time challenges related to cybersecurity and information security, where they worked as a Cyber Incident Response and the top four teams had to present their solution and ideas for a major cyber-attack case to Deloitte leaders in the stage event. “The unique competition format with challenges being unfolded on the spot was breath-taking. Not to mention the opportunity to interact and network with senior leaders at Deloitte, which helped us gain insights about the cyberspace and risks involved,” he added.